Since its inception a couple years ago, this website has really only focused on big budgeted, wide-release films. Sure, we would cover smaller movies, but only if they were in the race for to perhaps be nominated for an Oscar. But what we have failed to do is to cover the independent films. When I say independent, I mean shoe-string budget, filmed in your backyard kind of movies. Before, I was hesitant to cover these kinds of movies, because they kind of went against what I believed to be the platform of this website. Now, I realize that was a little bit ignorant of me. 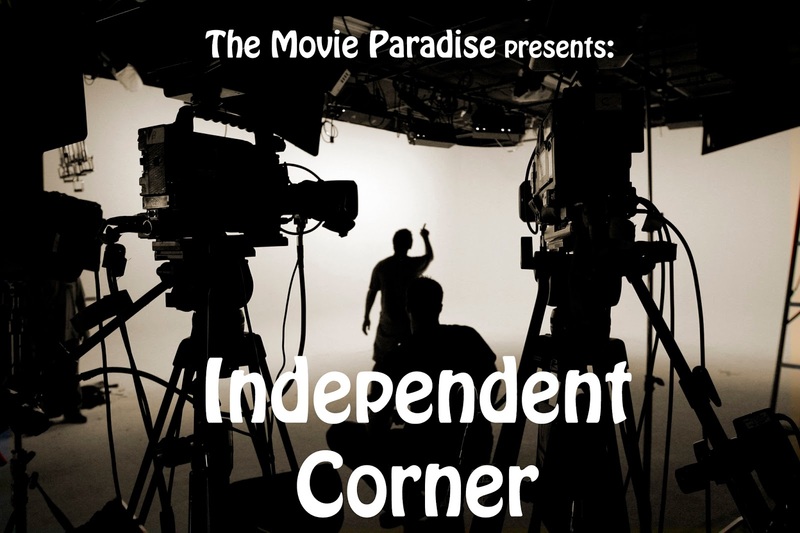 So I now happily present to you our newest article series Independent Corner, where I will spotlight independent films, and talk with the creative minds behind these projects. What went into making the short? Since it's so low budget, how did you get all the equipment, sets, props, etc. in order to make the film look like it had ten times the budget? "Relapse was shot sporadically over the course of about 10 days, but was in post-production for several months. We shot with very little equipment. Our camera team was the director running around like a crazy person. We lit the majority of the film with glow-sticks, which is why it's the most colorful action film you'll ever see. What made this film come together was the amazing team that volunteered their time, often on overnight shoots in the middle of the desert. That paired with director James Poirier's vision made this thing really tight." How were you able to achieve the stunt and fighting choreography? It honestly looked better than a lot of action movies today. "Thanks for that! 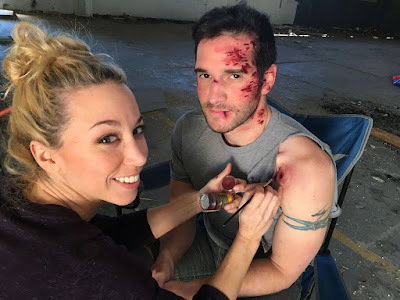 We are really proud of how the action in this piece came out, and really wanted to stay to real-world military tactics while filming. James has been directing action films forever, and it's amazing to be on set seeing him figure out the best way to kill you! 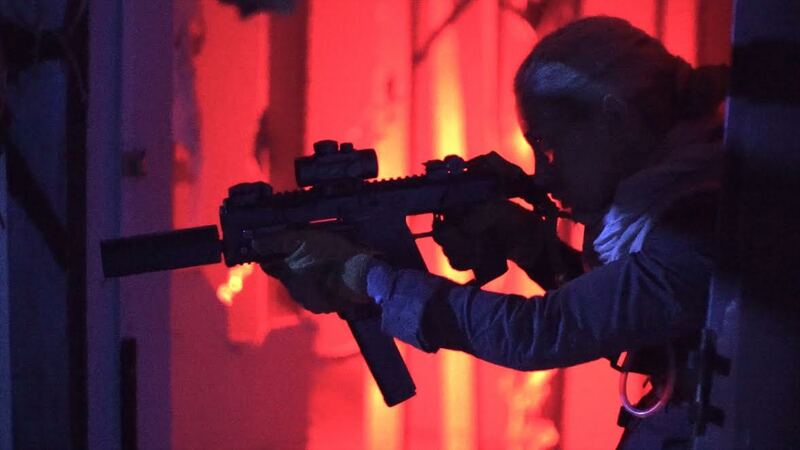 I basically slept with a rifle in my bed for a few months leading up to this role. Both Dre Swain and I needed to feel like this was second nature to us, and James held rifle training sessions for us on a regular basis. 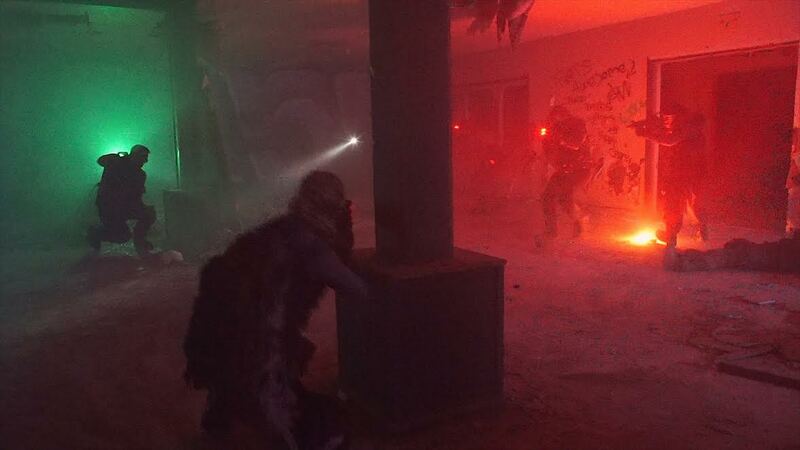 Additionally, we had an awesome stunt team come out to play the enemy soldiers. Talk about a sight to see. Those boys knew how to move. When it comes to making movies, it really takes a village." What was the biggest focus of the production? Was it simply to make a cool looking action movie, or did you have larger priorities? I saw a lot of beautiful camerawork and cinematography, and a lot of great editing tricks in dealing with Dust's PTSD. "The film actually started as Dre Swain and I looking to shoot a short fight scene, and when we asked James to shoot it, he basically said 'If we're gonna do it, let's do it right.' So fast forward a year, [and] we have a full-fledged short film. 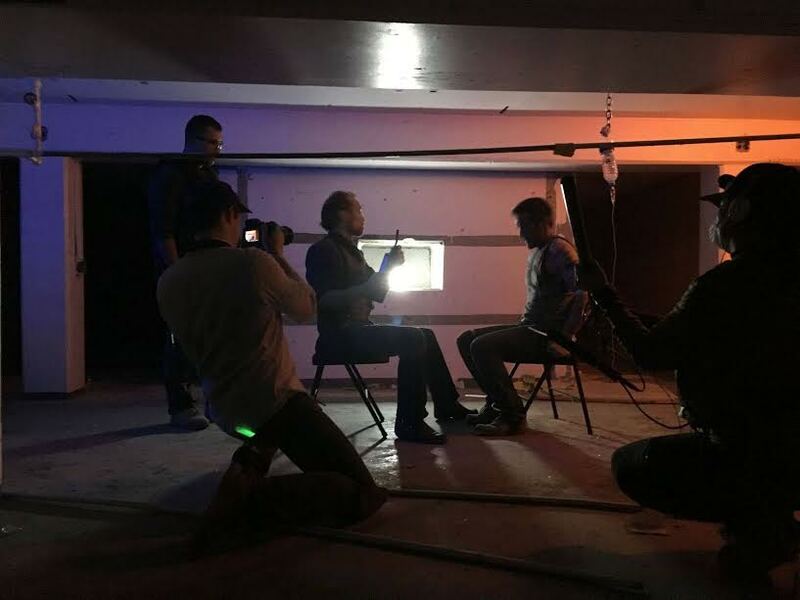 Since then, we've been developing a larger feature film, and hope to use Relapse as [a] showcase of our ability to work on a tight budget." What inspiration did you draw from? Not just in achieving the aesthetic look and feel of the film, but in making an effective and concise short film as well. "As an actor, when you're in full tactical kit, standing in an abandoned village at 3AM, and you hear the quiet footsteps of the enemy around the corner, that's about as much inspiration as you need. It truly was an immersive experience as a performer. That's what I loved about action movies. There's nothing that gets you into character faster than almost getting punched in the face. As far as inspiration for creating the product, this is just a stepping stone. Too many people make their little movies and think it's the best thing in the world. Others make them and have no confidence in them. Relapse is super cool! And we're excited to see what's next." I understand that you are bringing the short to film festivals now. What festivals are you participating in, and when and how will people be able to watch the short? When you premiered the short, what would you say was the overall reaction from the audience? "The audience [enjoyed] it! Whenever you show a film at a festival, it's always a mixed bag of great films and... 'okay' films. I'm happy to report that most of the people thought Relapse was better than 'okay'! Not many people have seen the full film yet, but we are hoping that we can find a place to host it soon, because I think people are really gonna like it." So you were a producer and the main actor in the film. What went into you doing both of those parts? Was it hard doing double duty? "Yes. Yes it was. And thank you for asking this. I had a ton of help on this one. I live my life in a constant state of producing. One friend has described hanging out with me as 'half-work'. As a producer in the micro-budget world, simply put, I am in charge of all the logistics. The cast, the crew, the people, the food, the location, the schedule, etc. It's a huge job in its own right. Now, to throw acting into the mix, you have to be able to switch from character mode to producer mode at at a moment's notice. I like to think it was mission accomplished, but it was really tough for me. When I produce, my producing is solid, and unfortunately the acting takes the back burner. This was the biggest project I've produced, so I'll call it lesson learned!" "I'm always working like a madman. The next movie for James and I is a feature film, so if you know anyone who wants to give us a couple thousand dollars, hit me up! 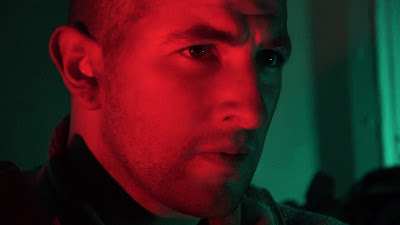 Besides that, there's a horror feature I acted in expected to come out at some point. And I have a few other acting gigs on the horizon, but for now I think the plan is to keep the acting and the producing separate." Well, I really enjoyed the short. It's very well crafted, excellently choreographed, and is adrenaline-rushing. This short is of the utmost quality, and it really transcends being a low budget film to just being a film. I think the next Taken and Die Hard movies need to take a lesson from these guys on how to do action right! What really shines through this short is the ability of these very talented individuals to put a compelling film on screen. They turned in something that looks ten times its actual budget, and that is incredibly impressive. I am very excited to see what Gabriel Caste and James Poirier do next. Relapse stars Gabriel Caste, Dre Swain, Nick Apostolides and James Logan, and is directed by James Poirier. You can find Tenth Gate Productions on Facebook and Instagram @tenthgateproductions, and on Twitter @xgproductions. You can also follow Gabriel Caste on Twitter @GabeCaste. To find out more information on Relapse, visit its page on IMDB.com. What do you think? How did you like the interview with Gabriel Caste? What points of his did you like? Did you check out the trailer for Relapse? Are you interested in seeing his short? What feedback do you have for this new article series? Anything I can change/improve? Leave your thoughts in the comments section below.